Distinguishing features: Brown forewings with white/cream colored spots. Black hind wings with white/cream colored spots/markings. 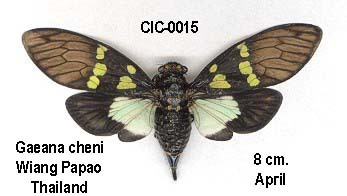 Distinguishing features: Black/Brown forewings with chartreuse/yellow spots. Black and mint-green hind wings. A photo of a living G. festiva. Distinguishing features: Gaeana festiva come in an amazing variety of color variations. Colors include orange, yellow, white and pale green; fore and hind wings are often different colors as well. 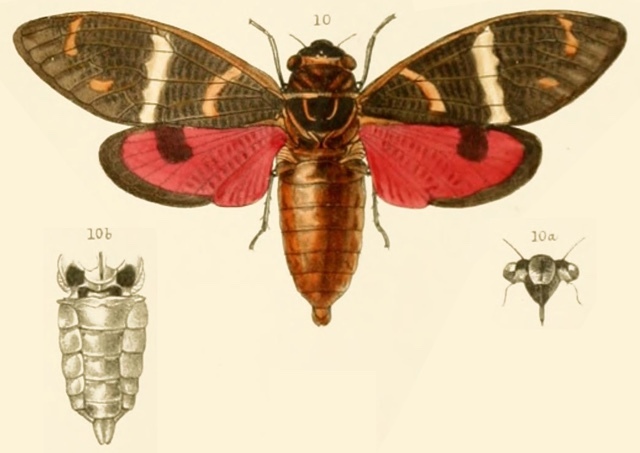 G. festiva, as Michel Boulard speculates, might be a periodical cicada, as it emerges in very large numbers 2. They might he proto-periodical as well. A photo of a Gaeana hageni specimen. Distinguishing features: Chartreuse-green forewings. White hind wings. No spots (unlike most Gaeana). A photo of a living G. maculata. A photo of a Gaeana sulphurea specimen. Distinguishing features: Black and yellow wings & body. Distinguishing features: Dark brown forewings with striking yellow lines forming a triangle-like shape. Dark brown and yellow hind wings. Distinguishing features: Dark brown forewings with red veins and striking yellow lines, sort of in the shape of the number 7. Black hind wings with white markings. 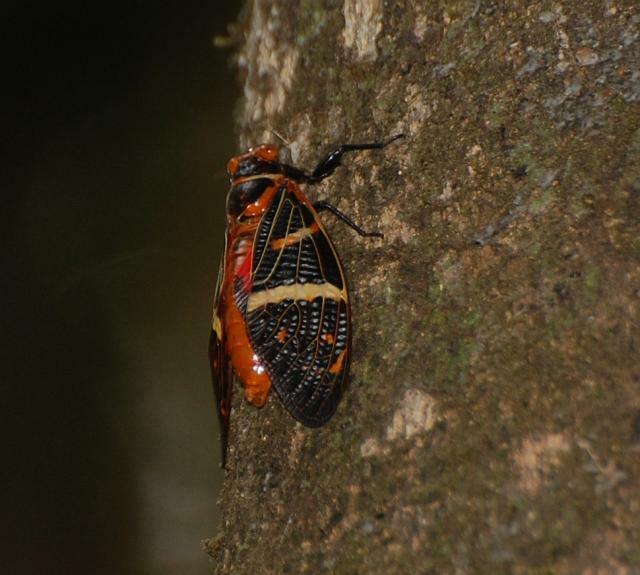 Sanborn, Allen F., Phillips, Polly K. and Sites, Robert W. The Cicadas of Thailand (Hemiptera: Cicadidae). p 1. Boulard, Michel. 2007. The Cicadas of Thailand, General and Particular Characteristics, Volume 1. p 66,72, Plate 30. Distant, W.L. 1892. A Monograph of Oriental Cicadidae. The Order of the Trustees of the Indian Museum of Calcutta. p 104-108.